I first came across these on Pinterest and tracked the idea back to CraftsbyAmanda. Are they not awesome? 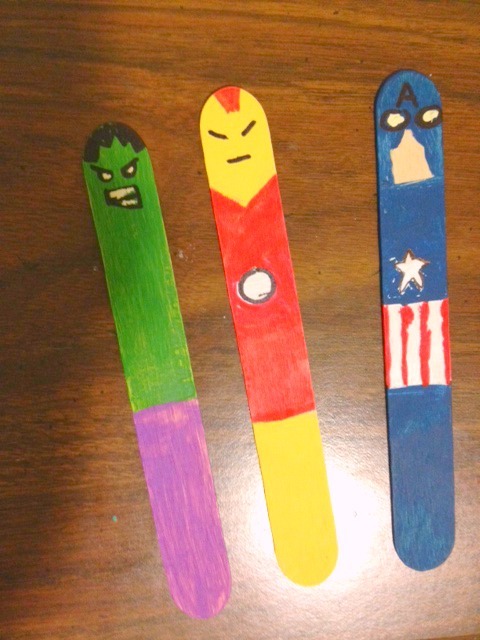 I am thinking making these should be some sort of reward for reading ... maybe for completing X number of books or genres or pages or minutes or whatever after the first month of school? Our schoolwide "theme" this year is Superheroes. Mine do not look as good as hers. First try, though. Freehand. With a ratty one inch foam brush. I am going to look for some nice permanent markers. I think that would be easier to get the detail in and still get the bright color that makes them look cool. In person, anyway. This is a rubbish shot but I am too impatient to try again! And now to think up how I might do some of the other superheroes ... or heroines!